Who can compete in Miss pageants? Miss pageants are known to be the most competitive and most popular because it's the competition level when most contestants are at their prime for competing. National pageant prizes in this category can range from money to modeling contracts, and even partial or full-ride scholarships to college, so generally speaking miss contestants have the most to gain, or to lose depending on how you look at it. All pageant systems have their own unique sets of rules, but these are some guidelines that apply when it comes to pageants for "miss" level contestants. Every pageant is different, but age requirements range somewhere between 18 and 28 years old. Most systems require contestants to be single and never before married. If there is a state preliminary, pageants in the U.S. typically ask for established residency of some type for the state in which you are competing. For every national and international system, there are dozens more local, regional, and state pageants in which to compete. Depending on your interests and level of experience, finding a contest to enter should be fairly easy at the miss level due to being the most popular age range and the most popular for the audience, sponsors, and charities that welcome publicity from platform promotion and appearances by titleholders. As one of the most popular categories, miss competitions are also some of the most competitive. So if you are competing in a miss pageant, it's imperative that you prepare as much as possible prior to competition. Even if it's a smaller pageant with less contestants, you can bet on at least a couple contestants being polished and ready to win - and you should be as well. The best way to prepare for a miss pageant is to understand the competition categories and take steps to prepare for each one in its own way. A good pageant coach or consultant can help you work on the areas where the most improvement is needed. But not everyone can afford a coach, especially if you are entering multiple local pageants. That's one of the reasons we created the Ultimate Miss Pageant Notebook - to help you with DIY preparation for a miss pageant. This notebook explains how miss pageants work and will help you categorize each phase of the contest to put together a preparation plan and follow it through to the event. It also explains an important aspect of miss pageants - the pageant platform. Inside the Miss Pageant Notebook is a pageant platform generator to help you choose and properly write your platform. There is also a speech generator to help you build an opening statement for preliminary interviews - a common requirement for many local and regional miss pageants. 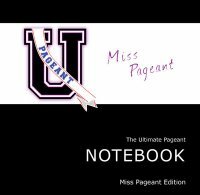 If you are thinking of competing in a miss pageant, or if you have already registered and have an upcoming competition to prepare for, The Ultimate Miss Pageant Notebook may help you get organized and ready to compete at your best potential.